From the stately white-column mansions of Magnolia Bend to Alligator Bayou’s quaint backwoods cottages, delight in a picturesque setting that evokes the romance of rural Louisiana. Take a short walk along the Sassagoula River to Disney's Port Orleans Resort – French Quarter, known for Southern specialties like gumbo, jambalaya and beignets. Cross the bridge to a 3-plus acre hideaway with an old-fashioned swimmin’ hole and sawmill slide. Inspired by the story of Tom Sawyer, Ol’ Man Island even features a catch-and-release fishing hole and stories told around an evening campfire. The nearby Muddy Rivers pool bar and a hot tub provide fun for grown folks. Learn more about recreation at Disney’s Port Orleans Resort – Riverside. 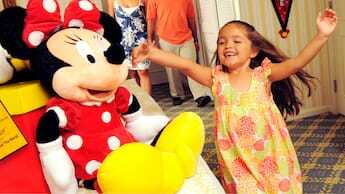 These fully refurbished rooms boast fun regal touches from Tiana and her prince and princess pals. Savor hearty, Southern-inspired dinner fare in a unique setting styled like a shipbuilding yard. Bring your pampered pooch to stay with you at Disney’s Port Orleans Resort - Riverside.